Get Off My Garden is a citronella scented jelly granule product. Specific applications are for defending soil areas such as flower beds or planters against fouling and digging. Wash and Get Off spray is a unique two in one formula that will not only clean up fox fouling but will also remove the associated territory scent thus protecting the area from further attack. 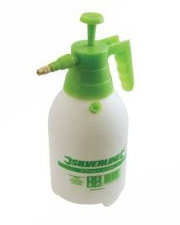 Supplied in a ready to use 500ml sprayer Wash and Get Off leaves a fresh citrus aroma after application. Particularly effective on hard surfaces such as patios and driveways. Also effective against cat and dog fouling. To purchase any of our fox repellents visit our online store or you may prefer to call us on 0844 804 0630 during normal office hours and we will be happy to take your order. In London and the home counties Foxolutions provide the "Brush Off" repellent service to a host of clients ranging from private residences and schools to sports grounds and commercial premises. Perimeters of gardens, pitches, courts and other high risk areas are sprayed with a protective ring which provides a highly effective chemical barrier. 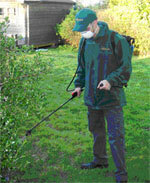 We also provide deterrent installation, proofing works and fouling clearance services. Call for details. During experiments carried out by Greenwich University on the subject of fox deterrence the ScareCrow Motion Activated Deterrent System was found to be extremely effective. We have had a great deal of success in protecting gardens and water features from foxes with this system. 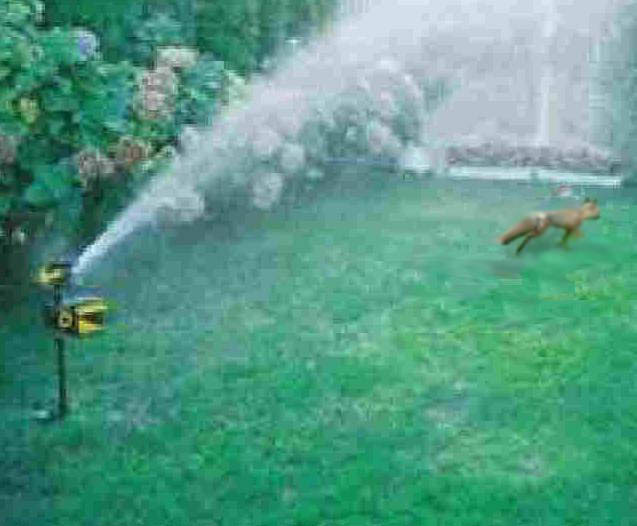 The ScareCrow motion-activated sprinkler automatically detects foxes as they approach, and repels them with a short but startling burst of water. The sudden noise, movement and spray scares animals away, teaching them to avoid the area in future. Foxolutions offer a comprehensive range of fox proofing and exclusion services from the supply and fit of “Prickle" and "Brickle" strips to deter foxes from climbing over fences to the blocking off of entry points under sheds and decking. Electrified fencing may also be supplied as a DIY kit or with professional installation subject to full site survey. This can be particularly effective for protecting areas such as bowling greens and croquet lawns. If you keep poultry or rabbits ask about our electric netting solutions. Netting is easy to put up, just as easy to move, and provides a highly effective deterrent. It's also very forgiving as it does not require much tensioning and adapts easily to slopes and dips in the ground. Call us on 0844 804 0630 during normal office hours to discuss your requirements. There are several inherent disease risks associated with fox faeces which are covered in the fox problems page of this website. It is important to always clear up faeces as soon as possible using a poop scoop and bag and to deposit it in a safe and secure bin. This is so as not to allow sufficient time for any roundworm eggs to incubate. We recommend thoroughly disinfecting areas with PX Parvo disinfectant which is designed specifically for the purpose of sanitising areas that have been fouled by canines. Dog owners can significantly reduce the risk of transmission of disease to their pets in this way. Foxes will often defecate in conspicuous areas as a further means of territorial boundary marking and for this reason it is advisable to spray repellent in these areas once the fouling has been removed and the ground disinfected. If your lawn is suffering from dying patches of turf caused by fox urine we have a solution. Lawn Rescue is a ready to use spray which neutralises the staining agents and acid in the urine by converting them into natural salts. The salts pass down easily to the grass roots where they nourish the lawn. Lawn Rescue should be applied at the first appearance of staining. It is also effective for treating areas effected by pet urine. Between the months of February and June there is a strong likelihood of the area under the decking/shed being occupied by a vixen with cubs. Foxes always have a back up Earth which they can fall back on if necessary so moving her on wont be too much of a hardship for her. 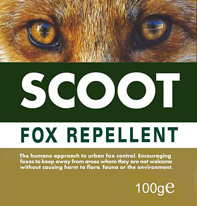 In London and the home counties Foxolutions offer an intensive repellent spray treatment or alternatively you may purchase some Scoot fox repellent and thoroughly douse some rags with it. Push the rags under the decking/shed via the entrance with a stick. Disturb the entrance as much as you can and apply Scoot to the area. 5 Litre sprayers are ideal for this application as they have a long lance which can get to hard to reach areas. This scent marking should send a message that the den has been discovered and it will be safer to move on. 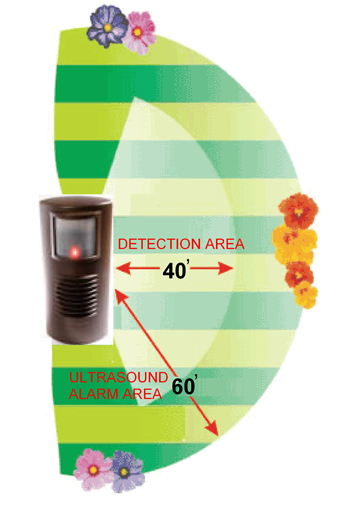 The installation of a Foxwatch Ultrasonic Deterrent at the entrance to the void will also increase the likelihood of a swift exit for the foxes. The next step is to place sticks (the small green garden canes are ideal) over the entrance like a grill. Make sure they are pushed into the soil just firmly enough to prevent the wind from blowing them and place them around an inch apart covering the entire entrance or entrances if there are more than one. Next day check if the canes have been disturbed. If so replace them and check again the following day. You must ensure the sticks remain undisturbed for at least 48hrs before you assume the den has been deserted and it is safe to proof it. 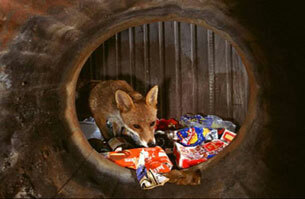 As soon as you are certain that the foxes have gone, take steps to prevent them returning. Foxes do not like decking/sheds that have draughts under them, and usually use ones that are in the corner of the garden with a wall or fence on two sides. If there is rubbish piled behind the decking/shed you have to clear the rubbish, and open up the area so that it is exposed and draughty. 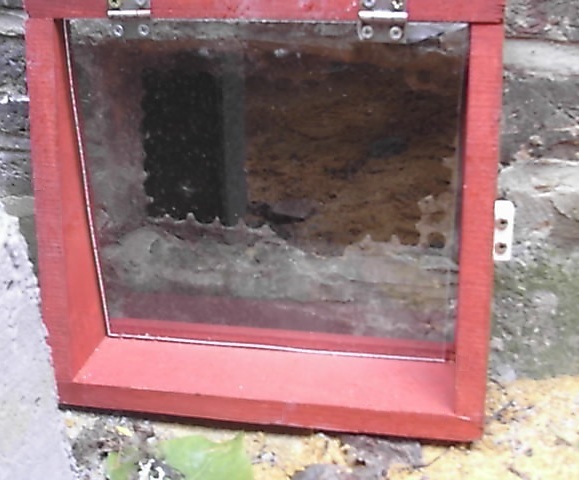 If you want to be absolutely sure that they will not come back, securely fix weld mesh (not chicken wire) around the bottom of the decking/shed, covering the gap and dig at least 12 inches (30 cm) into the soil.